Cooking on the cheap is never easy when you’ve got a taste for the finer things in life. There’s only so many times you can enthusiastically tuck into a plate of baked beans on toast without craving something a little more complex. With this in mind, I headed to Waitrose to scavenge in the cost-price near-expired section of the fridges to see what I could come up with, and I came home brandishing several kilos of top-quality braising steak. Braising, or stewing steak, is great when thrown into the slow-cooker or crockpot for a minimum of five hours with some tasty bits from the pantry. And super-cheap. Especially when you can buy at a discount. Tuck some away into the freezer for a rainy day and you’ll always have some protein on-hand for a hearty meal. Dice the steak into bite-sized pieces and toss in the cornflour until coated. This recipe will make your house smell like the inside of a Chinese takeaway, and it will taste just as good as what they have to offer. Serve with rice and stir-fried vegetables and you’ll feed 4 people for as little as £6.00. 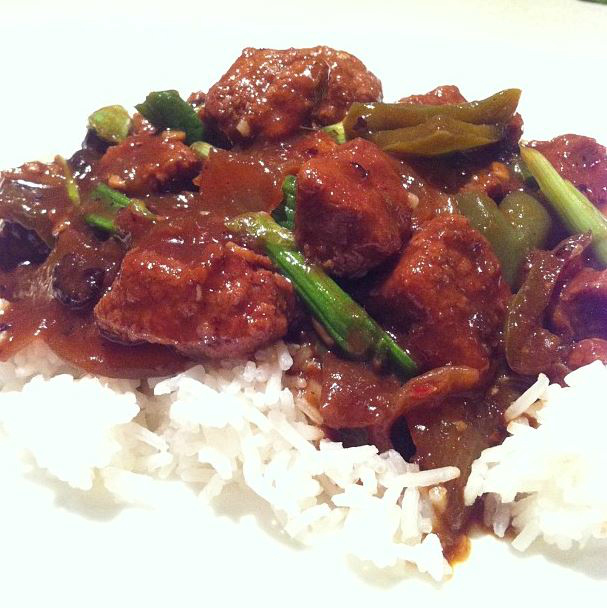 Tags: beef, beef recipe, cheap, cheap meals, chinese, Chinese recipe, cooking, crockpot, food, recipe, slow-cooker, slow-cooker recipes. Bookmark the permalink. Waitrose scavenging is one of my favourite things. The one I go to don’t have a section of reduced things so it’s a real game of hide and seek looking for the little red labels hidden on the shelves! Great find with the braising steak 😀 this sounds bloody lovely! Looks delicious! I don’t have a slow cooker but I want to give this a go! Looks good so I’ll give it a go. If it can be thrown in the crockpot and left alone then I’m in! I may have to improvise on a few of the ingredients (my pantry is not always stocked well, lol), but that picture made me hungry just looking at it! This looks great! I’ve recently acquired a slow cooker so will definitely be trying this out. Thanks!